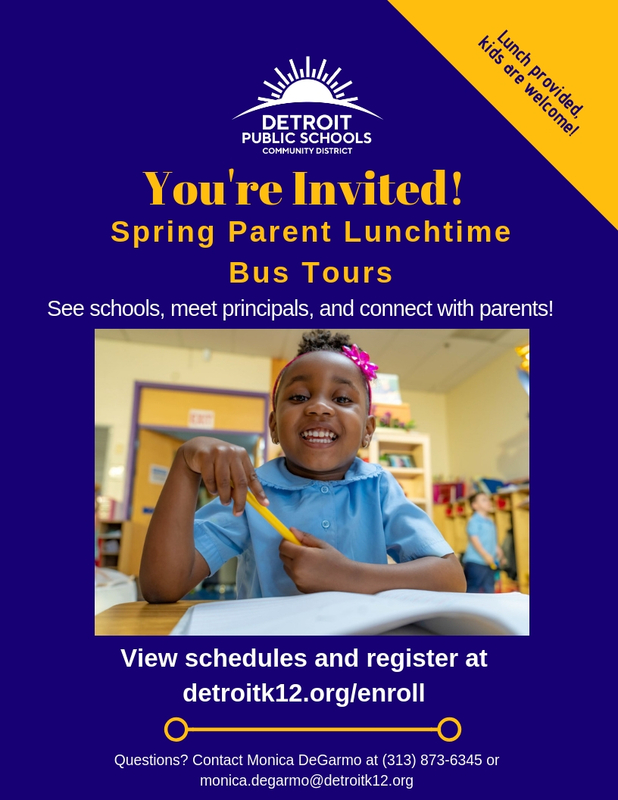 Detroit Public Schools Community District invites prospective parents to tour several schools this spring. We will offer a series of seven lunchtime tours in neighborhoods across the city. Tour schools in Midtown, Greater Downtown, the East Side, Northwest Detroit and Southwest Detroit. Learn about the exceptional programming and enriching activities available to DPSCD students including Montessori, art, music, dance, sports and much more. This is an excellent opportunity to see our schools in action! Lunch and free parking will be provided. Tours will leave from their designated locations at 11:30 a.m. and return by 1:30 p.m. Please arrive by 11:15 a.m.